A subsidiary of AMR Corporation, American Airlines (AA) is based at Dallas Fort Worth with hubs in Chicago, Miami and New York. and regional services within North America and international services to Europe, Asia, Central America and South America. American Airlines has launched	aa.com/blackatlas, an African-American site that replaces the standalone microsite BlackAtlas.com. This site is an example of the airline�s ongoing focus to actively engage its diverse customers through the company�s largest owned communication channel, aa.com. American will drive its customers to this new page via email, home page banners and text links when sharing news or communicating promotions/sweepstakes and events, such as the recent American Black Film Festival. FORT WORTH, Texas - American Airlines today launches daily nonstop service between New York's John F. Kennedy International Airport (JFK) and Dublin Airport (DUB), adding a new destination to American's extensive network and giving customers traveling from Dublin nonstop connections out of JFK to cities throughout North, Central and South America. The new flight is in addition to American's existing nonstop service from Chicago O'Hare International Airport (ORD) to Dublin and complements its 12 other daily nonstop flights from JFK to Europe. The route will be operated with a two-class Boeing 757-200 with 181 seats. The new service is operated as part of American's joint business agreement with fellow oneworld� members British Airways and Iberia, connecting travelers to more than 125 cities throughout Europe. The new route provides American's customers access to countless destinations worldwide through nonstop service from Dublin on British Airways and Iberia to the carriers' respective hubs in London and Madrid. "Thanks to our joint business with British Airways and Iberia, this new service connects American's customers to a wealth of travel options throughout Europe," said Tim Ahern, American's Vice President � New York and International. "Adding this route enhances our expanding global network out of JFK and further establishes American's commitment to providing our customers in New York seamless, one-stop connections to major business and leisure destinations in Europe." 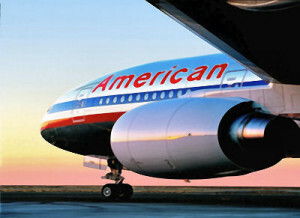 In addition to the new route between New York and Dublin, American added new service earlier this year between Dallas/Fort Worth and Lima, Peru, and Seoul, South Korea, and between Chicago O'Hare and Dusseldorf, Germany, delivering on the airline's business plan and network strategy designed to provide more access and choices for customers in key international markets. American also plans to expand international service, pending government approval, between Miami and Curitiba and Porto Alegre, Brazil and Bogota, Colombia, and from Los Angeles to Sao Paulo later this year.